Our goal is to vaccinate and sterilise five to six thousand animals per year, educate regarding responsible pet ownership, and raise awareness of the link between the welfare of the animals in a community and the welfare of the people. While the devastation brought by the tsunami is no longer front page news, the recovery process will take years, as will recovery from the recently ended civil war that lasted almost 30 years. 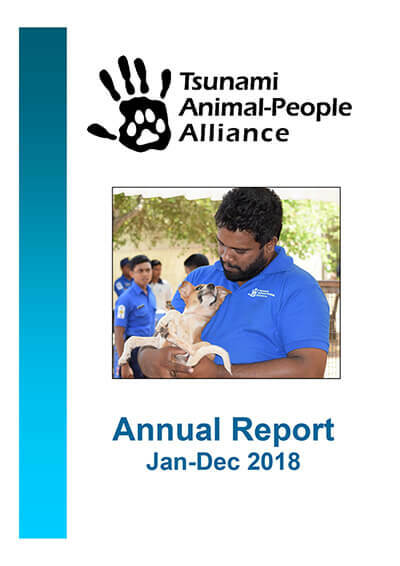 The non-profit Tsunami Animal-People Alliance is dedicated to reducing rabies and dog bites in the disaster zone and refugee settlements of Sri Lanka by the combination of vaccination and sterilisation. Without sterilisation, new generations of animals needing vaccination will continue to be produced. Sterilisation and vaccination provide humane animal population control that reduces rabies and dog bites, mitigates the threat of mass killing of animals, and improves the welfare of both the people and the animals of Sri Lanka. The Tsunami Animal-People Alliance operates a field sterilisation clinic that moves within the tsunami disaster zone and the former war zone, including refugee settlements, providing rabies vaccinations, sterilisations, and general vet treatment to animals who are individually owned, community owned, or true strays. The Sri Lankan people have been very receptive to our Sri Lankan teams’ helping their communities and their animals. Download our annual report (PDF). We rely 100% on donations.